” Malcolm Turnbull is more interested in giving a $80-billion-dollar tax cut to big business than he is to improving the lives of First Nations People. ” There is very little money going into the Closing the Gap service areas, in fact there is no new money that has been allocated there. So, the priorities for Closing the Gap which are linked to the reduction in housing funding is a serious worry for many of our people. And not just Indigenous Peoples, but service providers and public sector health providers. The whole approach of this Government is neglectful of First Nations People in the remote areas. “We are pleased that there will be subsidies for 6000 jobs and an improved assessment process to ensure vulnerable people are not forced to participate beyond their capabilities. ” Yet again, our people have been let down with this year’s Federal Budget. The investment in our communities is more eroded, our quality of life more diminished, our voices and needs more blatantly ignored. While the Budget seeks to commemorate colonisation, it fails to address its ongoing consequences and the oppression that our people continue to experience. The most alarming aspects of the Budget further stack the system against our people and punish people living in poverty. As a co-chair of NATSILS, I have been actively involved in trying to engage with governments to provide insight and solutions into justice and social issues we face, and the need for greater investment. It is disheartening that they are not listening, and actively doing damage to our communities. Closing the Gap is not mentioned, despite a year-long refresh agenda. There is some welcome investment in Indigenous health organisations and aged care for Aboriginal and Torres Strait Islander people. The Government has shown no respect, no vision, no plan, no insight and no desire to improve the lives of First Nations people. This budget clearly demonstrates why First Nations people need a Voice to the Parliament.  Slashing 1.5 billion dollars to remote housing over the next four years.  Western Australia, South Australia and Queensland will no longer receive any funding for remote housing. These savage cuts to housing will have a devastating effect in remote communities, where overcrowding and homelessness are rife.  Housing is key determinant to close the gap and underpins the health and well-being of First Nations Peoples. Without safe and secure housing, the gap will never be closed.  No new funding has been allocated to the Closing the Gap strategy, despite the Government announcing a 10 year refresh process in February this year. 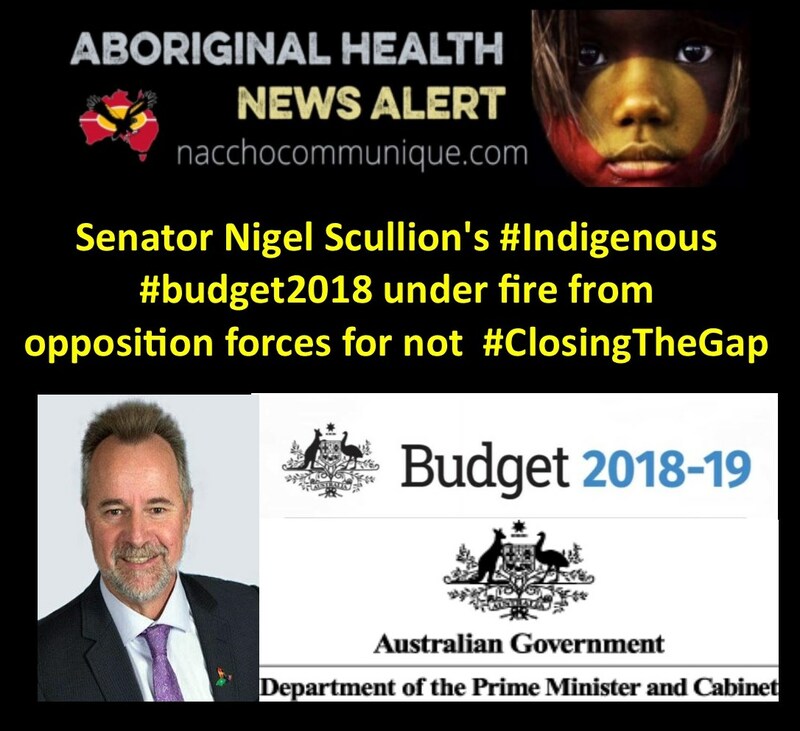  The fact that the Government has failed to allocate adequate funding to the Closing the Gap Refresh is insulting to First Nations peoples and their peak organisations who have been trying to cooperate with the Government on new Closing the Gap targets.  The closing the gap strategy has been left to languish under this Government, while the gap widens. 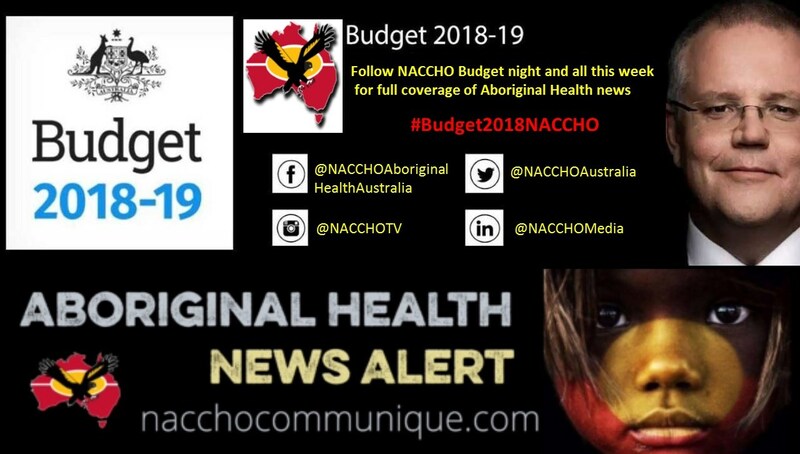  Further, the government has yet again failed to fund the Implementation Plan for the National Aboriginal and Torres Strait Islander Health Plan 2013-2023.  Failing to address the strategic, integrated and practical reform needed to the CDP program. 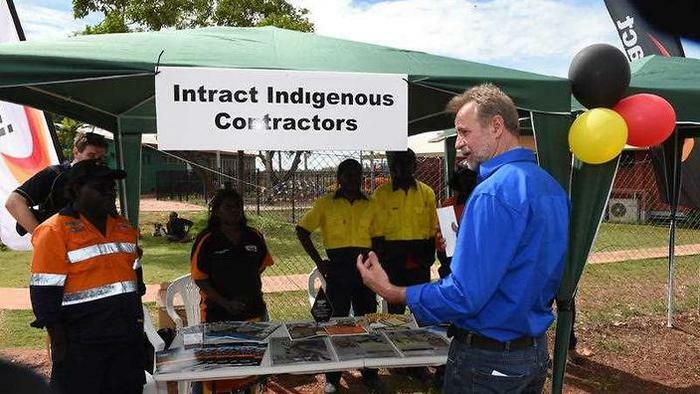  The Minister for Indigenous Affairs Nigel Scullion announced 6,000 new wage-based subsides, but this leaves some 30,000 First Nations peoples subject to the current punitive, discriminatory CDP scheme, which is driving up poverty in remote areas.  Failing to address the shameful over-incarceration of First Nations Peoples.  The Government has not provided funding to implement the recommendations from the Northern Territory Royal Commission, or the Australian Law Reform Commissions ‘Pathways to Justice’ report.  Both the Northern Territory Royal Commission and the ALRC Inquiry into the incarceration rates of Aboriginal and Torres Strait Islander People were called for by the Turnbull Government, to effectively wash their hands of its findings and provide no fiscal outlays for the recommendations exhibits a shameful lack of leadership.  This is a human rights abrogation and shows a callous disregard for equal justice for First Nations people.  Labor has long called for national justice targets, to reduce incarceration rates and improve community safety.  First Nations children, our future Australians, are left behind in this budget.  In 2017, more than 17,000 Aboriginal and Torres Strait Islander children were living in out-of-home care, compared with about 9,000 a decade ago.  To respond to the shocking number of Aboriginal kids growing up away from country and culture, a Labor Government will convene a national summit on First Nations Children in our first 100 days. Part 2 ABC Interview SUBJECTS: Budget, Remote Housing, CDP, Closing the Gap, Captain Cook monuments. MOLLY HUNT: Senator, what’s your reaction to last night’s budget? 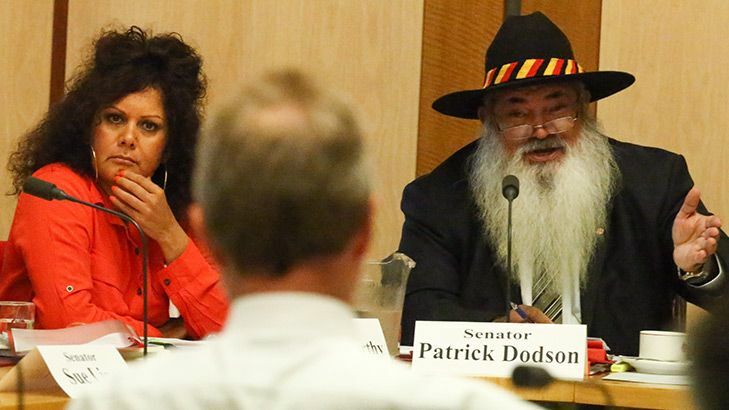 SENATOR DODSON: Well, from the First Nations perspective it’s pretty poor. It’s unimaginative and disastrous. 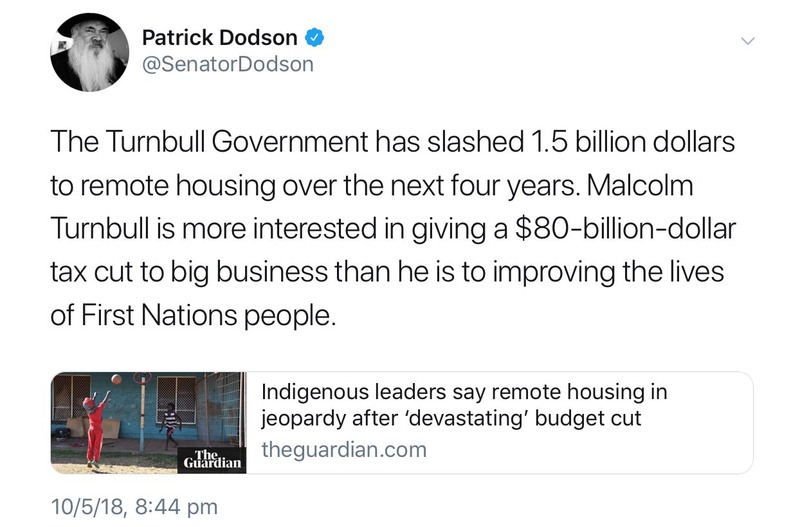 Remote housing to the State (of WA) is not being supported by the Federal Government’s budget which means over the next couple of years there will be at least 1.5 billion dollars slashed to remote housing. The Western Australian portion of that is annually is around $100 million dollars. This means serious impacts for people in the regions in relation to housing. We have no money allocated for roads in this budget. The Territory is getting an upgrade to the Buntine Highway; most of the roads money for WA is going into the metropolitan areas. There is very little money going into the Closing the Gap service areas, in fact there is no new money that has been allocated there. There are some positives in the procurement area in other states but that doesn’t help in many of these places. There’s some money allocated into Indigenous Protected Areas, $15 million dollars, but what take of that comes into the Kimberley is unclear at this point, but hopefully some of it comes there. There is also some money in age care which we hope will help in some of those cases where carers have to look after their families at home. Again the detail around that in relation to the Northern part of the State is not clear. There’s a bit of a tantalising flirt with the CDP, with a promise of 6000 new wage type subsidies for a scheme that has absolutely failed First Nations peoples. There are 30,000 current CDP participants and there is no clarity about what their destinies are going to be. So the budget is very disappointing. A very sad neglect of First Nations peoples and an indictment on the Turnbull Government that pretends it wants to do things with First Nations peoples. And it’s a neglect of the bush as well. There is no clarity around the mobile black spot concerns that many of our people in remote areas have got or any improvement of communication systems to the remote areas. The whole question of how that could assist families, pastoral properties and others – there is no clarity around that at all and that is a major concern. We know there is some funding for the Cape Leveque Road which is a good thing, but that’s not out of this budget, that has come with the state’s contributions as well. So overall, a very sad return for First Nations. It looks like the cuts to the IAS overall is going to mean a lot of hardship to service providers. The clarity around that we are yet to distil but there will be cuts like there are to all departments, I think of about $32 million dollars to the IAS… but there is no reform, no insight and no real plan to move things to a better place for Indigenous peoples. MOLLY HUNT: You’re with ABC Kimberley, I’m talking to WA Senator Patrick Dodson, my name is Molly Hunt. Senator, we have about three minutes until the seven o’clock news, I just want to know, is the Government making any substantiative changes to the ongoing trial of the cashless welfare card in this year’s extension? SENATOR DODSON: The Government wants to roll it out in Kalgoorlie. Labor is obviously not happy about that. There is not sufficient evidence to say its working either in Kununurra or Ceduna. The need for wrap around services obviously have to be improved. The Government wanted to introduce drug testing, we’ve opposed that, but it will more than likely come up in the Senate during these sittings with Kalgoorlie. But it has no other mandate from the Parliament to go further than Kalgoorlie until there is some clear and unequivocal evidence that this particular draconian measure actually works. MOLLY HUNT: And just lastly Senator, overall impression of last night’s budget? SENATOR DODSON: Well as I said I’m like the kid at the Christmas tree watching all the other kids jumping with joy and celebrating and waiting for their wrappers to be dropped to the floor so we can pick them up. MOLLY HUNT: Senator, do you support the money for the Captain Cook anniversary? SENATOR DODSON: Well no, not really. 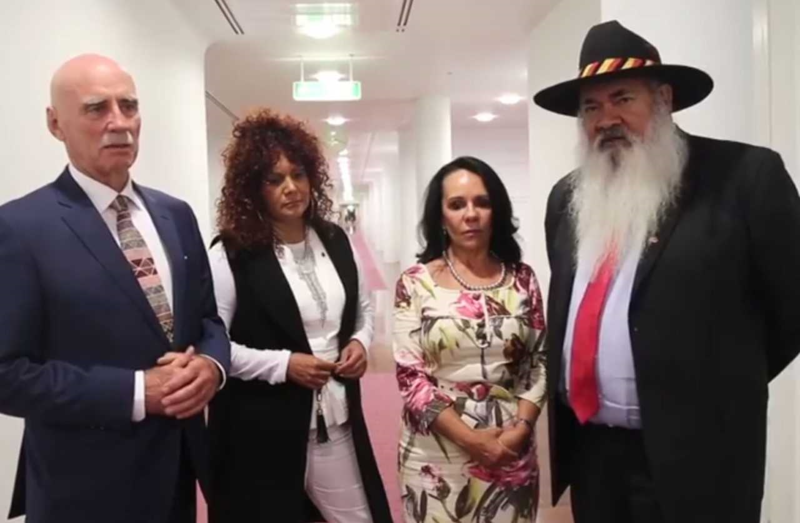 I think we have got to find ways to deal with our history and we have heard from the Uluru Statement from the Heart for the need for a truth telling commission, for a Makarrata Commission, so we can come to a greater consensus around the settlement narrative, the occupation narrative and the so called discovery narrative of this nation. I think we have to get beyond these colonial and draconian measures that keep continuing to divide us. “The hard work of APO NT and other Aboriginal organisations and CDP providers has started to pay-off, with the Minister for Indigenous Affairs recognising that paid work with proper entitlements is the key to lifting families out of poverty, stimulating social enterprise and creating meaningful employment opportunities,” said Mr Paterson. However, the Government has engaged in a cherry-picking exercise rather than wholeheartedly adopting the positive Aboriginal community-driven model developed by APO NT, which will limit the benefits possible on the ground,” said Mr Paterson. “Equal pay for equal work is a core tenet of Australian society. The Federal Government must eliminate the blatantly discriminatory requirement which sees people in remote Aboriginal and Torres Strait Islander communities forced to work more hours for the same basic Centrelink payment as people in cities,” said Ms Walters. “The inclusion of more onerous compliance measures is likely to drive up poverty and disengagement. The Government’s own data indicates that people subject to the remote CDP scheme are already at least 20 times more likely to be financially penalised,” said Mr Paterson. “Unfair financial penalties have already seen parents struggling to put food on the table for their kids. 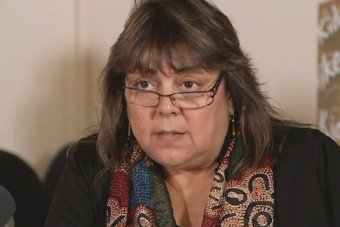 The Government appears satisfied to dump a new harsh one-size-fits-all penalty system on remote communities, but still discriminate against them in terms of work hours,” said Ms Walters.  Flexibility and community governance structures so that jobs and community projects meet the needs of communities and remote employers.  An approach to participation obligations that allows local organisations to tailor arrangements to their own communities, with a focus on support and incentives, rather than heavy-handed compliance and financial penalties.  Work activity obligations that are no greater than those that apply to people in the urban Jobactive program.  1500 paid jobs with training for people under 25, giving disengaged young people a reason to re-engage and a pathway to future employment.  An Aboriginal and Torres Strait Islander led agency to manage the scheme instead of the current non-Indigenous led Canberra-based model.  A reduction in pointless and excessive administration requirements, which is a hallmark of the current program and consumes valuable funding. Yet again, our people have been let down with this year’s Federal Budget. The investment in our communities is more eroded, our quality of life more diminished, our voices and needs more blatantly ignored. One role of the Government is to recognise that poverty, racial and structural disadvantage exists and to do something about it, including making the right investments to drive change. More pressure has been placed on rural and remote communities to increase employment where there are no opportunities, and at the same time, the National Partnership agreements on remote housing for WA, Qld and SA have not been funded. Yet we know that many people accessing Aboriginal and Torres Strait Islander Legal Services need help with housing and tenancy. These measures are set to create more legal need and greater barriers to accessing justice which directly impacts upon people’s physical, emotional and social wellbeing. Stringent measures deducting welfare payments from people with unpaid fines and outstanding warrants have been introduced. These measures come in the face of increasing rates of over-representation, and a demonstrated connection between poverty and imprisonment for Aboriginal and Torres Strait Islander people. Across Australia, governments should be abolishing imprisonment for unpaid fines, not deducting welfare payments from people who are already oppressed by the system. This will likely have a huge impact on Aboriginal and Torres Strait Islander communities. We cannot afford to lose more lives to unpaid fines. The concerning welfare measures include extending a punitive demerit point system to Community Development Program (CDP) participants. This cuts and suspends welfare payments for weeks at a time, risking further deep financial disadvantage for our most vulnerable people. The over-penalising of CDP participants is causing high levels of financial hardship and shows that the program is deeply flawed. Since the introduction of the CDP, 300,000 financial penalties were applied, despite having only around 33,000 participants. Despite the clear failures of the CDP, only minor improvements were introduced, including a new wage subsidy scheme and slight reduction in the hours participants need to work for their benefits. But for a wage subsidy scheme to have any impact, there must be jobs available in the first place. The loss of people’s income is causing deep distress and harming health. The CDEP programs previously supported within our communities, in my view, more adequately met the needs of our people and contributed to building community capacity. On the other hand, the Budget is strangely silent on justice, family violence, Closing the Gap and child protection. All of these areas have been identified as ‘a national crisis’ and are all interlinked. Yet the Government has neglected the needs of our people who are victims and survivors of family violence. And while the NDIS is fully funded, there is no funding to ensure Aboriginal and Torres Strait Islander people with disability will have equal access to culturally-safe support services under the NDIS. When it comes to justice, the Australian Government has ignored the findings from their own Law Reform Commission ‘Pathways to Justice’ and Northern Territory Royal Commission inquiries. The recommendations, including introducing national justice targets, support for justice reinvestment and Aboriginal and Torres Strait Islander Legal Services to deliver essential legal help, did not form part of the Budget. Instead, they have introduced oppressive, punitive measures which will disproportionately affect Aboriginal and Torres Strait Islander people’s quality of life. We all know the statistics. Aboriginal and Torres Strait Islander people are 13 times more likely to be imprisoned than non-Indigenous people. This is worse, and increasing, for Aboriginal and Torres Strait Islander women, who are imprisoned at 21 times the rate of non-Indigenous women. Aboriginal and Torres Strait Islander children, who are 6% of the Australian youth population, make up 55% of children and young people in prison are 25 times more likely to be imprisoned. How can it be, that these shameful statistics, continue to be ignored by our Commonwealth, state and territory governments. The escalation of increasing rates of overrepresentation demonstrates current government policy and programs are not meeting the needs of our people. And we know that the Government could save $19 billion annually by 2040 if the gap between Indigenous and non-Indigenous rates of incarceration were closed. The welcome investment in Indigenous health will not outweigh the government’s changes to housing and welfare, which will further entrench disadvantage. This will lead to more unmet legal need for Aboriginal and Torres Strait Islander Legal services, already at crisis level. This need must be comprehensively mapped to determine the gaps in providing essential legal help.